That was all a bit meh. The Master's beginning to look silly rather than being a genuine threat. 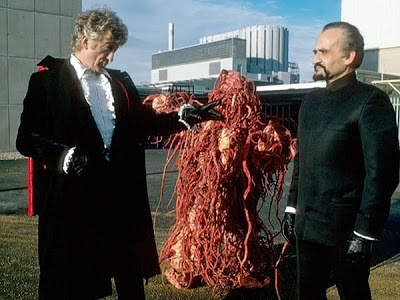 As I said in 'The Mind of Evil' article the battle between the Doctor & the Master looks less like a battle to the death than a bizarre game between two renegade Timelords with too much time on their hands. You get the impression that they get together for tea in between adventures to award points. The survival of the UNIT regulars stretches credulity to almost breaking point. As Captain Yates & Sargent Benton try to escape instead of being ruthlessly blown up (as several lowly UNIT privates are in the course of this story) the Axons decided to jump on board the Land Rover for a polite punch up. Chinn from the MOD is too lightweight & could be played by Ronnie Barker if he'd been in the mood. He's a pompous buffoon - even his boss thinks he's rubbish - but he survives the final battle at the end, presumably to collect a P45 after recovering from the shock. Don't get me started on Pig Bin Josh. Other people before for me have done so & will probably do so better but really what was the point. Which brings me to Bill Filer. Why? His role seemed to be to do all the things an assistant is supposed to do - get captured, replicated, escape & reveal an important plot point - with an American accent. It's also a performance of some dullness from Paul Grist. You could have let Jo do pretty much everything Filer does but I suppose he was there to give some hint of the global nature of the search for The Master & UNIT. Even so. We did get a glimpse of Jo Grant's underwear (an occupational hazard whilst wearing skirts that short) but that doesn't make things any better. Neither does an early appearance from Tim Piggott-Smith as Captain Harker. I'm not sure about Jo Grant. She enthusiastic & optimistic & has an absolute faith in the Doctor but sometimes you just want her to stop being quite so dumb. Pertwee does a lot of neck rubbing in this one to. I'm inclined to think the more neck rubbing he does the worse the story. Pretty much a bog standard Pertwee story but with additional irritants.